Since the mid-1990s health practitioners, researchers, and scientists have learned that regular exercise and nutritional balance can significantly reduce degenerative diseases associated with aging and extend the human life span. The mechanism by which this occurs involves numerous physiological and biochemical mechanisms. For instance, researchers know that exercise improves neurological function by improving the transmission of nerve impulses in nerves and brain pathways. When this occurs, the human body experiences improved mood, faster reflexes, and better endocrine control. Regular exercise and the consumption of nutrient-dense vegetables help reduce the incidence of cardiovascular disease, diabetes, certain cancers, and brain aging. younger age. Previously, non-insulin-dependent, or Type II, diabetes mellitus was considered a disease of middle age. Now it is being diagnosed in children as young as ten years of age. The incidence of this disease increased 40 percent from 1990 to 2000, with a 70 percent increase in thirty-year-olds during this same decade. Given these statistics, the benefits of regular exercise and good nutrition should be seriously considered by those who live in the Western world. In addition, heart failure and diabetes are linked because diabetes accelerates atherosclerosis and can increase the risk of heart attacks and strokes by as much as sixfold. Diabetes is also associated with damage to numerous organs and tissues, including the kidneys, eyes, and nervous system. Diabetes is recognized as the leading cause of blindness and kidney failure in the United States. These two conditions can be drastically reduced by a combination of regular exercise and balanced nutrition. For example, it has been recognized that there is a strong link between childhood Type II diabetes and obesity, with 90 percent of such children being obese. Conversely, while other factors play a role, lack of exercise and poor nutritional choices play a major role in both diseases. By flooding the body with a high intake of fats and simple sugars, cells become resistant to insulin function. That is, the pancreas is able to manufacture enough insulin but it is unable to transfer the glucose into the cell. If the process continues, the pancreas will eventually exhaust itself and be unable to produce more insulin. When this occurs, the diabetic person becomes insulin dependent, and is characterized as having Type I diabetes mellitus. Medical professionals recognize that exercise improves glucose entry into the muscles and that many Type II diabetics can be managed or, in some cases, cured through a regular program of exercise and nutritional changes. Nutritional changes are particularly important and many failures are caused by the diabetic's failure to adhere to these dietary changes. Numerous diseases are related to the production of free radicals by cells. Free radicals are destructive chemicals, mostly produced during metabolism that oxidize fats, DNA, and proteins within cells and tissues. For example, oxidation of fats within the walls of blood vessels is thought to result in the formation of atherosclerotic plaques that clog the arteries. Likewise, when diabetes develops the number of free radicals formed increases significantly, and when complications develop the rate increases dramatically. These free radicals begin to damage cells and tissues, resulting in the numerous complications associated with the disease. Exercise not only reduces the incidence of the diseases responsible for many of these free radicals, but it induces the tissues and cells to produce more antioxidant enzymes. A diet high in fruits and vegetables, especially the more nutrient-dense vegetables, significantly reduces the incidence of cardiovascular disease and diabetes and reduces the severity of these disorders by providing the body with very powerful and versatile antioxidants. Most people are aware of the vitamin-based antioxidants, such as vitamins A, C, and E, and the carotenoids (i.e., beta-carotene and lycopene), but of equal or greater importance are the plant-based flavonoids. Researchers have identified over 5,000 flavonoids, which have been shown to be powerful and versatile antioxidants against numerous types of free radicals—including many that are not neutralized by vitamins A, C, and E.
A multitude of studies have shown that a diet high in nutrient-dense vegetables and fruits can significantly lower the incidence of many cancers, hypertension, diabetes, and atherosclerosis, and delay nervous system aging. In one study, in which various fruits and vegetables were tested, it was found that blueberries, strawberries, and spinach were the most powerful in slowing brain aging, as measured by careful studies of brain chemistry and function. Regular exercise has also been shown to slow brain aging changes. When combined with good nutrition, an even greater effect can be expected. Regular exercise and good nutrition have been shown to reduce the incidence of certain cancers as well. This is especially true for colon cancer and breast cancer. The explanation may lie in the improved immune function, increasing the number of antioxidant enzymes, and metabolic efficiency induced by exercise. Numerous nutritional components, such as vitamins, minerals, and flavonoids, have also been shown to significantly inhibit cancer formation, growth, and spread. Studies have shown that nutrients do this by a multitude of methods involving cell biochemistry and enhanced immunity. While exercise is critical to good health, too much exercise can be harmful, and even bring on many of the diseases human beings are attempting to prevent. This is because extreme exercise, by significantly increasing metabolism, also dramatically increases free radical production. As the human body ages, it produces more free radicals and accumulates more free radical damage in cells. Studies have shown that after age seventy DNA accumulates free radical damage ten times faster than at a younger age. 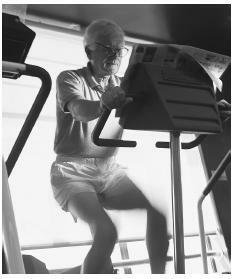 Extreme exercise would be especially hazardous for the elderly. Moderate exercise has been shown to provide the same amount of health benefits as more vigorous exercise programs. For ultimate benefits, doctors generally recommend that individuals exercise at a moderate level at least three times a week, avoid simple sugars, eat complex carbohydrates low on the glycemic index, maintain a fat intake slightly below 30 percent of caloric intake, and include a small amount of lean meats in their diets. Berenson, Gerald S., et al. "Association between Multiple Cardiovascular Risk Factors and Atherosclerosis on Children and Young Adults." The New England Journal of Medicine 338 (1998): 1650–1656. Blair, Stephen N., Harold W. Kohl, and Carolyn E. Barlow. "Physical Activity, Physical Fitness, and All-Cause Mortality in Women: Do Women Need to be Active?" Journal of the American College of Nutrition 12 (1993):368–371. Blaylock, Russell L. "Neurodegeneration and Aging of the Central Nervous System: Prevention and Treatment by Phytochemicals and Metabolic Nutrients." Integrative Medicine 1 (1999):117–133. Drake, D. A. "A Longitudinal Study of Physical Activity and Breast Cancer Prediction." Cancer Nursing 24 (2001):371–377. Fliatarone, Maria A., et al. "Exercise Training and Nutritional Supplementation for Physical Frailty in Very Elderly People." The New England Journal of Medicine 330 (1994):1769–1775. Kramsch, D. M., et al. "Reduction of Coronary Atherosclerosis by Moderate Conditioning Exercise in Monkeys on an Atherogenic Diet." New England Journal of Medicine 305 (1981):1483–1489. Kujala, Urho M., Jaakko Kaprio, Seppo Sarna, and Markku Koskenvuo. "Relationship of Leisure-Time, Physical Activity and Mortality: The Finnish Twin Cohort." Journal of the American Medical Association 279 (1998):440–444. Leon, A. S., J. Connett, D. R. Jacobs, and R. Rauramaa. "Leisure-Time Physical Activity Levels and Risk of Coronary Heart Diesease and Death: The Multiple Risk Factor Intervention Trial." Journal of the American Medical Association 285 (1987):2388–2395. Littman, A. J., L. F. Voigt, S. A. Beresford, and N. S. Weiss. "Recreational Physical Activity and Endometrial Cancer Risk." American Journal Epidemiology 154 (2001):924–933. Packer, Lester. "Oxidants, Antioxidant Nutrients and the Athlete." Journal of Sports Science 15 (1997):353–363. Powell, Kenneth, Carl J. Caspersen, Jeffrey P. Koplan, and Earl S. Ford. "Physical Activity and Chronic Disease." American Journal Clinical Nutrition 49 (1989): 999–1006.